I feel I have to constantly remind myself I'm on Maui. Riding in the back of a pickup as the saturated green surrounds me, watching the stars and taking in the endless flow of Palm Trees. Where I live is off the iconic Hana Highway, I can't get enough of the clean air and fresh breeze that constantly blows through the property. The winds are strong on the east side of Maui, as I learn that Maui weather is extremely unpredictable. The storms come off the ocean so very quickly, and each part of the island has differing climates. We’ve made various trips into Kihei, Kahulia, Waliua, Waliema, and find ourselves mostly to the closest tourist town Paia, an antique surf town. Highlights this week included a scenic hike up to Twin Falls, done in flip-flops mind you. It was secluded and worth the drive. Living on Maui can be pricey, although the island boasts some of the best tasting fruit. Everything tastes sweeter, bananas, grapgerfuirt, tangerine. It’s the real deal. Better to wait for the fruit to fall off the tree than to buy in it the super market! The avocados are delicious, and we jump on the fresh fruit once it’s the slightest bit ripened. Our beautiful roommate Li has been living on the islands for over 35 years. 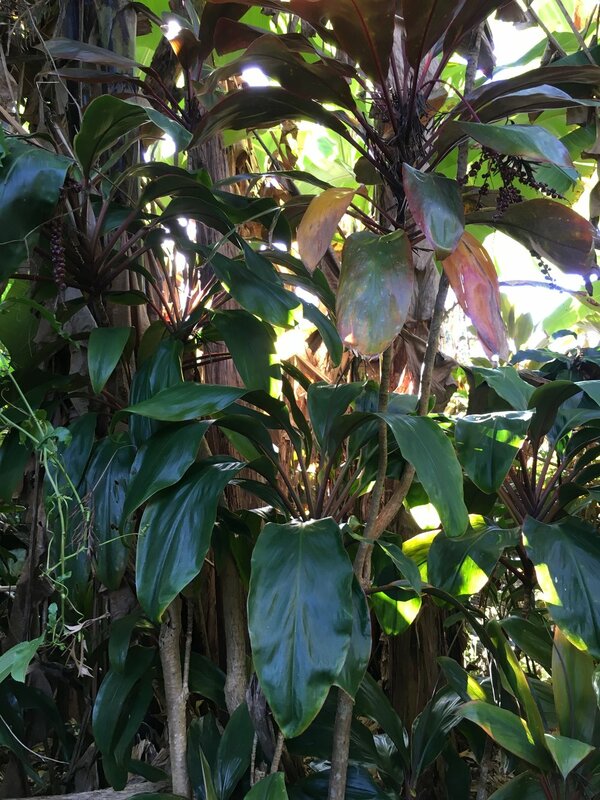 She is a wealth of knowledge, a kind soul and willing to tell you anything you may want to know about Hawaiian history, fauna, spirits, produce and language. On top of learning bit of Hawaiian, I’ve been listening to much French! I've learned how to say “Finished Work” in both Hawaiian and French. My Quebec roommates keep my language skills in check. "Pow Hana" means done work in Hawaiian, I think we all know that well. Our mornings are spent eating breakfast on the balcony overlooking the property. Our dishes range from local organic Hawaiian honey, to smashed avocado and banana smoothies. Many of my friends love the fresh Lilokio (passionfruit) I’m still warming up to it. I can't complain. We wake up to Palm Trees and the sound of the ocean every morning. I’m thankful for a friendly house and peaceful work load. We have many guests checking in as this is high season, so we are busy cleaning and preparing for arrivals each day. I’m reminded of how whats in your hand and in your heart is the key to your glorious future. It’s become the theme of this experience. I’ve held a peace inside that doesn’t ultimately relate to my surroundings, but it’s a peace that happens to be okay with what each day holds. A peace that waits for the future in hope, and a knowing that who and I am and things I long to do are possible. At night we hear the chorus of the geckos. We know these little green friends are around and we see them bouncing around quite frequently. They make little squeaking noises and they tend to poop a lot! Yet, the night falls, and I look forward to waking up to these beautiful surroundings. I don't know if anyone could ever tire of them. First Blog post from Maui!